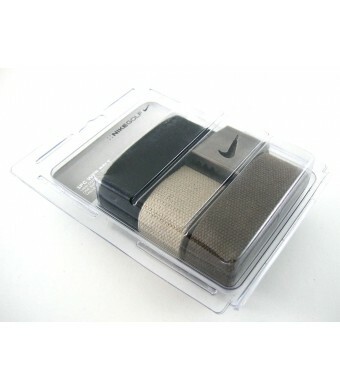 This three pack of Nike Gold Web Belts is versatile and completely adjustable that can be cut to fit any size up to a waist 42. The military-inspired buckle is made of rubberized metal featuring the Nike swoosh logo and is interchangeable between the belts for convenience. The colors available in this set are Black, Olive and Khaki.